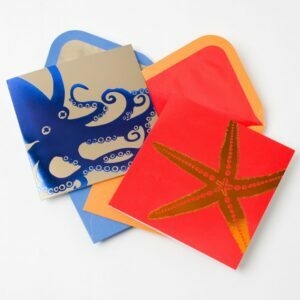 Receiving a letter written on the Octopus from the Papyrus Graphic Sea Life Assorted Note Cards Set is the inspiration for today’s blog topic! My thanks to my new Pen Pal met during InCoWriMo 2019 for introducing herself on the pretty notecard! AND for her reply, I received today naming the set of stationery. First, over at Papyrus, they are having a “BUY ONE, GET ONE 50% OFF SITEWIDE” online only sale through Friday, March 22. Second, it is not in stock at their site. However, they are offering the option to be notified when it is back in stock. Full details on the Papyrus coupon codes and promotions are available here. 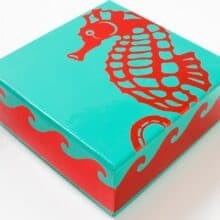 It is in a set of 20 cards (5 in x 5 in) and comes with a Keepsake box. 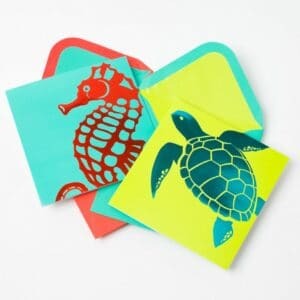 There are 20 coordinating lined envelopes which list for $17.95. They do require additional postage. The front and inside message is blank. 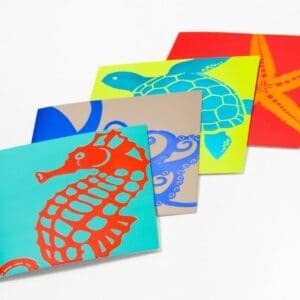 I especially love the foil treatment on the cover of the Octopus notecard! Again, my sincere thanks to my new Pen Pal. Her latest letter arrived in the mail today including telling me about the stationery since I had asked about it in my initial reply. Don’t you just love the letter writing volleys that go back and forth with corresponding through letter writing! There are many more letters in the queue that I’m making my way through replying to from InCoWriMo 2019. This is in parallel to still write my outgoing letters from the month-long event! Here’s to more letter writing – and plenty of stationery! P.S. The AnchoredScraps daily blog post countdown to 1500 continues with today being #1485!